Selling a property is probably one of the biggest, if not the biggest, single business transaction most people will negotiate throughout their entire lifetime. That’s a daunting thought, particularly when one stops to think about the circumstances which so often bring about the decision, in fact the necessity, to place the property on the market. The decision to sell is seldom an easy one. It is usually prompted by a major lifestyle change, additions to the family, a bereavement etc, all of which tend to add not only to the complexity of the transaction, but often, to the anxiety of the potential vendor. The need for a successful sale, close to the anticipated price and within reasonable time limits, is usually crucial to our future plans. And yet, how much do we really know and understand about the processes involved in selling and marketing Real Estate. Usually, the answer has to be ‘very little’, simply because it is not something one does very often. The management and staff at Nardella’s recognise your need to know as much as possible about the choices you are now about to make. Sixty years of successful trading has enabled us to establish, not only the respect and trust of the community, but also an unparalleled network of contacts. As these are the essential ingredients for a ‘successful sale’,my company is in a unique position to assist you with your next move. To sell your home, you only need one buyer, however, to achieve the best price the greatest possible number of prospective buyers should see your property. A well-planned and executed marketing campaign is critical to a successful sale. That’s why we strive for maximum exposure to the buyer market. The cost of marketing your property will vary from property to property; we will develop a marketing strategy which is appropriate for the sale of your home. We also monitor the marketing campaign, making revisions and amendments as required. Buyers are invited to inspect your property at the advertised times during the week and Saturdays. In this way we attract maximum number of buyers. Open-for-inspections mean fewer interruptions and less inconvenience to you, your family and lifestyle. Buyers also benefit from open-for-inspection as they do not have to spend time contacting the agent to arrange a private viewing, they can spend more time at the property than they may have at a private appointment and they can schedule inspections of various properties which may be of interest. Private viewings will be arranged when appropriate, we will contact you each week to notify you of the inspection day(s) and time(s) for your property. Our aim is to contact all active buyers registered at our office. This is done via email, phone, Email Property Alert, post and sms. Imagine yourself as a potential buyer wandering through your own house – what would you see? To make the right impression, it is often the littlest things that can make an enormous difference. We are able to advise you about getting ready to sell with qualified trades people, professional contacts with lawyers / conveyancers, body corporate permission and various ways to enhance your property. Remember, it’s all about creating an impression on the potential buyer, to make them feel comfortable in your space and to enhance their desire to purchase the lifestyle: to sell the dream. If your property is not occupied, we suggest furnishing the property modestly with beds, lounge/dining setting etc. We are able to arrange display furniture on your behalf. It’s all about the extra service we provide to help you get more money for your property. Please note, that whilst we suggest the above actions, this may not be essential to the successful marketing of your property. Our professional photographer will capture the character of your property ensuring that the most appealing aspects of your home are highlighted. A high impact Auction / For Sale board in front of your home can generate an amazing amount of buyer interest. Photos that reveal the features of your home and copy that describes its benefits will help stir the imagination of potential buyers. We can also arrange for the board to be lit at night, creating even more of an impact. During Open for Inspections we position pointer boards to direct traffic to the property. We will run photo advertisements in the metro and local papers -including ‘The Melbourne Times’ and ‘The Leader’, ‘The Age’ and ‘Herald Sun’. A floor plan will be drawn and incorporated into a brochure which we design as a further point-of-sale promotional item for prospective purchasers. We will assign a professional photographer to photograph your property. This ensures that the most appealing aspects of your property are highlighted. A copy writer may also be asked to write the text. Colour brochures will be printed and available at our office, open-inspections and letter box dropped in the area. Your property will be displayed in our window. The internet is a very important part of marketing your property as it works to sell your property 24 hours, seven days a week, worldwide. The asking price must be realistic. People make offers within 5 to 10 percent of what they consider a property to be worth. If offers for the property are consistently low, the asking price must be reviewed. The attention of passing potential purchasers will be captured by the board that is erected. It will act as a silent salesperson, 24 hours a day, 7 days a week. A brochure, Floor Plan, feature on the internet and some advertising are also advisable as the minimum marketing instruments. This is by far, our strongest option. Most properties sold in this area, sell via the Auction method. A definite auction date is set so that the sale does not drag on for months: the property often sells before or on the Auction date. An unconditional cash sale is called for. Pre-Auction advertising of three or four weeks, ensures an effective promotional period. An extensive, coordinated advertising campaign, through media such as ‘The Age’, ‘The Melbourne Times” and ‘The internet’ is launched. A large descriptive board is erected with photos and contact numbers. Prospective purchasers can make genuine offers for your consideration, before the Auction. As no price ceiling has been set, competitive bidding from purchasers at a well attended Auction (the reserve price is not known to the bidders) usually achieves a higher price for you, the Vendor. The Auction method prevents ‘haggling’ over price with only one buyer. If the asking price is unknown, we can’t be talked down. It places the onus for price on them. Competition from other bidders pushes the price up. A definite date for the offers to be accepted is set so that the sale does not drag on for months. Advertising of three or four weeks prior to the set date of offer, ensures an effective promotional period. An extensive, coordinated advertising campaign, through media such as ‘The Age’, ‘The Melbourne Times” and ‘The Melbourne Leader’ is launched calling for tenders. A large descriptive board is erected with photos. As no price ceiling has been set, competitive bidding from purchasers (the reserve price is not known) usually achieves a higher price for you, the Vendor. The Tender method prevents ‘haggling’ over price with only one buyer. If the asking price is unknown, we can’t be talked down. It places the onus for price on them. One of the most important aspects of marketing a property, is reporting our progress to the Vendor. Our service oriented program is designed to guarantee that our Vendors are kept fully informed at all times. Provide you with a progress report following inspections at your property. Ensure continued market exposure through our planned marketing campaign. Provide you with regular information relating to market activities which may affect your property. Photograph your property, in colour, for promotional display purposes. Arrange for the installation of our signboard within seven days. Provide you with weekly advertising report/response and copies of all advertisements which appeared that week. Provide suggestions that will present your property to its best advantage. Contact all our existing purchasers who are planning to purchase within your property’s price range and its location. Present all offers to you which have been obtained from prospective purchasers, in writing. Provide a full Auction presentation 2-3 days prior to the Auction. If you are happy with our proposal we ask you to sign an exclusive authority agreement in accordance with REIV guidelines. We will contact your solicitor to inform them that Nardella Real Estate is the exclusive agent acting on your behalf. We will assist your solicitor in every possible way. To avoid disputes after the sale, it is important that a complete and detailed list of the chattels be included in the contract. 12. Why Choose Nardella Real Estate? 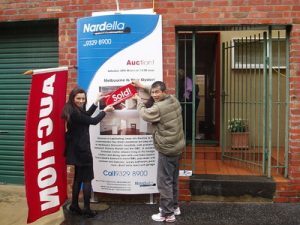 We at Nardella have the knowledge required, as we have been helping buyers and sellers in the area since 1951. With our honest approach, energy and enthusiasm we work hard to deliver the best result for our clients. These are the qualities you should look for in a Real Estate Agent. With our marketing strategy and up-to-date databases we ensure your property will receive the widest exposure. We guarantee the expert negotiating on your behalf to achieve the highest price. As you can see, we pride ourselves on our effort to communicate with the Vendor throughout the entire sales campaign. YOUR BUSINESS IS BIG BUSINESS.